Finding the time and means to meet your pod during busy weeks can feel like a burden. But we all know how great a good network or action oriented meeting can be, and that meeting often brings us motivation. The Chicago pod, undeterred by the traffic and chaos of the big city, has figured out a way to keep their pod momentum going, growing to over 145 members online! Thanks for taking time to talk with us today ladies! Frequency of meeting: Approximately 4 times per year (We do a lot of things online and have several events per year). Chicago is huge and getting around is a big challenge. Mission statement: Our MISSION is to serve society by making science open, inclusive, and accessible. Our VISION is that 500WS will be the foremost organization for the transformation of leadership, diversity, and public engagement in science. 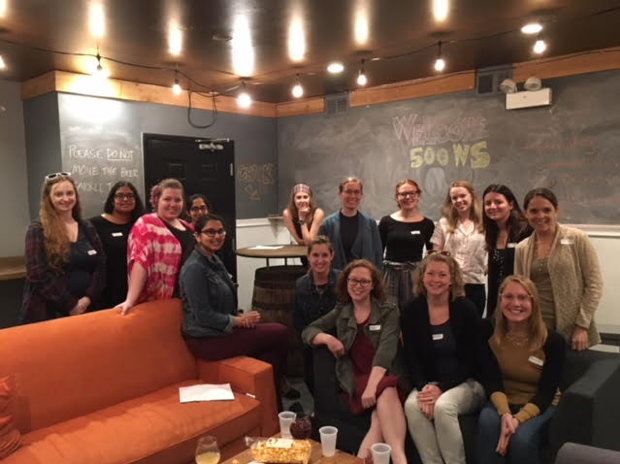 The Chicago pod of 500 Women Scientists was founded at The Morton Arboretum in Lisle, IL, but now includes 145 members from across the Chicago region. 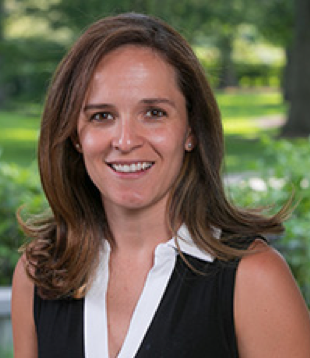 Our pod works to promote a diverse and inclusive scientific community that brings progressive science-based solutions to local and global challenges. We think globally but act locally, focusing efforts and advocacy in the Chicago area. We thought the general 500WS mission fit great with our vision and so decided to adopt it. We had a couple initial “brainstorming meetings” where we all said what we wanted from our pod and gave multiple ideas. After all the great ideas have been written down one of our main challenges in TIME. We all wish we had more time to devote to 500WS. This was the meeting where we launched our “City Subpod”. We also have a “West Suburbs Subpod”. We have recruited members through the different museums and universities in the Chicago area. In contrast with other smaller cities our challenge has been to find our niche within the myriad of science organizations in the Chicagoland area. We have Universities, a National Lab, large museums and Technology Hubs. We have reached to women leaders in these places and collaborate by cross-posting events and job or fellowship opportunities. In regards with diversity, Chicago is a pretty diverse and open city and so is our group! We have everything ranging from middle school girls to senior scientists from all races and a couple Trans and gay members. Although we have not made direct efforts to recruit ethnic minorities, I think we have a decent representation among our members (need to get more data on that one). We have not been very successful with meeting attendance lately but at the beginning we had meetings at cool venues where we work and provided a tour of the venue. We had a meeting at the Morton Arboretum, at Cantigny Gardens, at Benedictine University with a tour of their Natural History Museum and at a bar called Beermiscuos. For professional development we created an Expertise Directory where we all filled in a sheet with issues we could help other women with, and also issues we would like to get help. For example, one could provide help with applying to graduate school or career development, or managing family and work. This directory has been hugely successful and I actually got my current position because I sought the mentorship of a woman in the pod. We also share resources on science communication, and all types of professional development opportunities in the Chicago area. We “Ran for Trees” at the Morton Arboretum last Fall. For community building we do fun stuff. We have Happy Hour once every couple months, we did a race (see picure), we have attended tree plantings, mentoring events, and we just had a great “round table discussion” event with Dr. Janet Voight, Associate Curator of Invertebrate Zoology at the Field Museum, who does much of her research over a mile below the surface of the ocean, studying octopods and woodboring clams. I think mentoring has been one of our strongest action areas. We have held multiple mentoring meetings that have resulted in great interactions and new contacts. Expanding Your Horizons (EYH) 2018 A group of us Co-organized and attended a workshop on plants called “Plantastic” at the EYH 2018 fair for middle school girls that are interested in STEM at University of Chicago (https://eyhchicago.com/eyh2018/). As part of this event, members of our pod taught students how to read tree rings and built a wind tunnel to illustrate how seeds are dispersed by wind. Explaining to middle school girls how seeds disperse at EYH 2018. 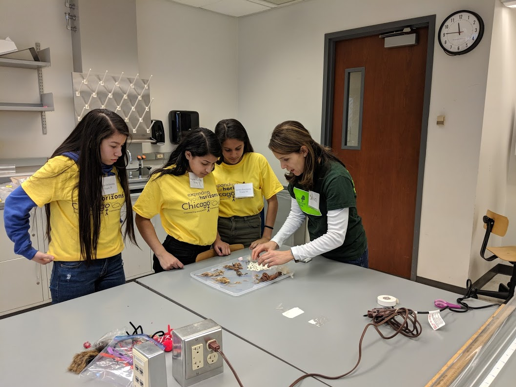 Girls IN2 STEM 2018 We also attended the Illinois Math and Science Academy (IMSA) Girls IN2 STEM event. Students from North Central College SMACS (Student Members of the American Chemical Society) helped with the activities. High school girls being taught by college girls how to extract DNA from flowers. 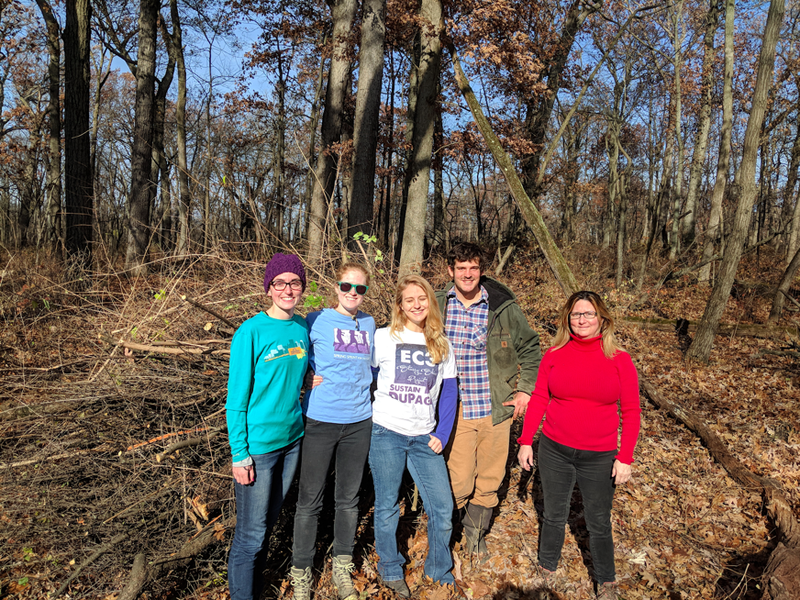 Restoration Work Day at Churchill Woods Forest Preserve. We had beautiful weather and had a great time clearing invasive buckthorn and honeysuckle. We also participated in the science march in 2017 and prepared a “Voting Guide for 500 WS” for this midterm elections and shared it with the group. For next year we hope to continue to focus on our three action areas. We are getting close to launching our Website, which we believe will be a huge benefit to our pod because a lot of our networking occurs online. We are holding elections for the West Suburbs Subpod and hope to get some new blood for 2019. We want to attend the EYH workshop again and have a table at the Wild Things Conference in 2019. We also want to expand our mentoring and outreach to minority-serving schools. Older PostHappy 2-yr anniversary and our 100th Take Action Tuesday post!